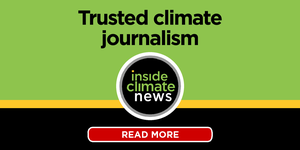 This article was produced by InsideClimate News. I walk in the front door of Byron Carter’s house as others are entering in the back, and Koda the dog can’t decide which way to direct her barking. I’m in Divide County, North Dakota, but borders seem a little meaningless here. Last summer’s drought, which was calamitous for Byron and the other farmers and ranchers now filing into his kitchen, leaked over into Canada, Divide’s border to the north, and Montana, to the west. 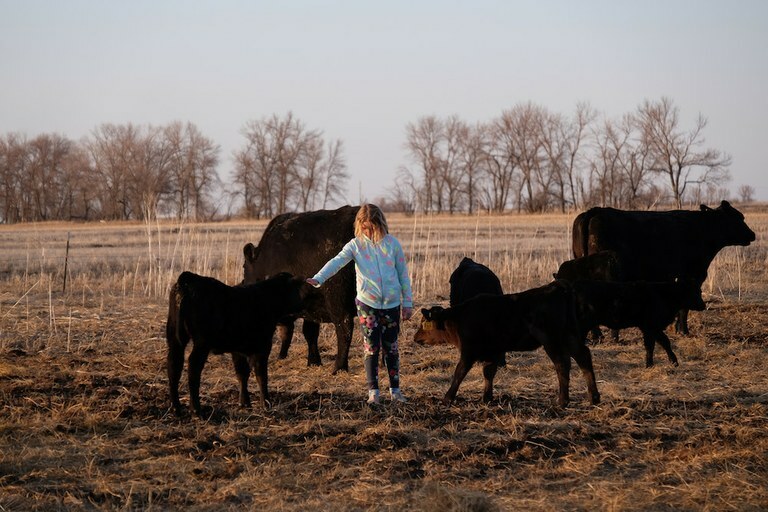 By April of this year, they’re on the cusp of a new season, and Byron has gathered his neighbors — defined as anyone living within a 30-mile radius in this sparsely populated corner of the state — so we can talk about drought and climate change. In 2017, ranchers were optimistic when they put their cattle out to graze in late spring. There’d been record snowfall over the winter, and regional forecasts weren’t calling for any drought conditions in their northwest region of the Great Plains. By May, though, concerns were rising. Rain failed to come, and the good winter moisture evaporated into a cloudless sky. 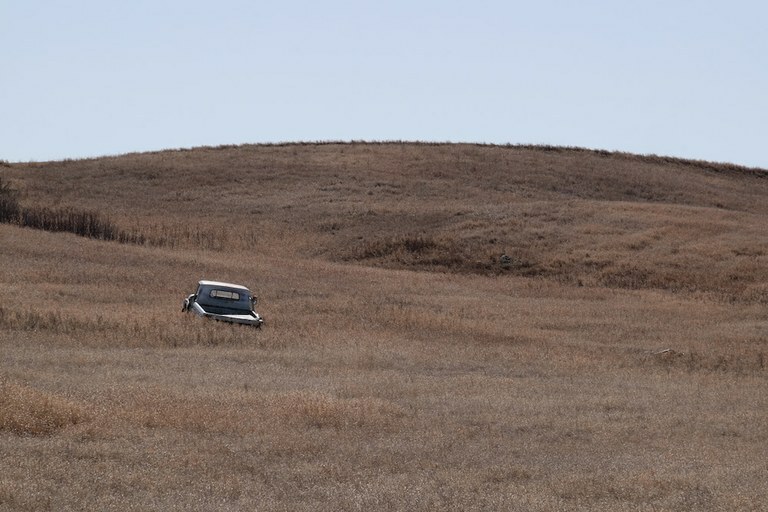 By July, two-thirds of the pastureland in the Dakotas was in poor condition, and across the High Plains, from Kansas up to Canada, temperatures were above normal while precipitation was low — perfect conditions for what’s known as a ”flash drought,” sudden and severe. By the first of August, the USDA reported that nearly three-quarters of North Dakota’s topsoil was desperately bereft of moisture. Part of Divide County was at the most severe drought level, and 60 percent of the state was facing some level of drought. It was the state’s fourth-driest summer since record-keeping started in 1895. Ranchers hauled water to their herds and vied for hay donations that flowed in from other regions after the state opened a hay lottery. Anything to supplement the feed of the hungry cattle. “We had six-tenths of rain about the 16th of June,” Byron remembers about last year’s rainfall, hopping up on the kitchen counter. The rest of us sit at his kitchen table, drinking coffee as our boots lay piled in the corner. “You’re measuring in fractions of an inch?” I ask. “Yes,” he says, adding that it’s easy to remember last year’s weather events, which every farmer-rancher keeps track of religiously, because “there weren’t any.” He recorded a total of 2 inches of precipitation all year compared to the average of about 12. You can feel the trepidation in the room. The prairie potholes of this northern Great Plains region are filled with fresh snowmelt, glistening in the late April sun, but it’s a mirage of sorts. When the frost line melts, the “land takes the drink” and the potholes mostly drain, but not enough to replenish the soil. While this region is one of the coldest parts of the continental United States, North Dakota is experiencing one of the greatest temperature increases in the Lower 48. An incremental uptick across the region means that it’s now running about 3 degrees Fahrenheit over last century’s average, a treacherous trend that can dry the land out too quickly in a region where ranchers rely on the rain to keep their rolling hills greens and their herds healthy. When the rains fail, ranchers can’t grow enough hay to feed their cattle. “Every year is different,” someone says, and there’s assent all around. 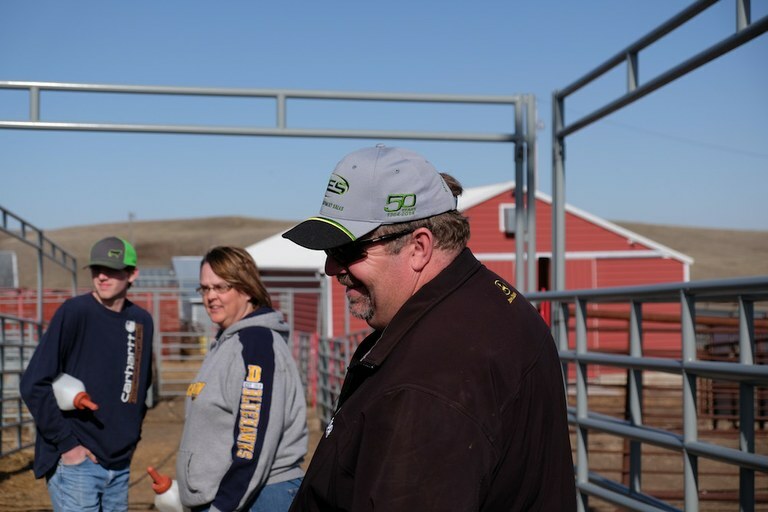 “It’s pretty tough to find anybody besides a farmer-rancher that loves Mother Earth as much as we do, because we work with it every day," says Byron Carter, with his wife, Shelley, and son, Bruce. Earlier that morning, I’d met with Keith Brown, who was the agricultural extension agent for Divide County for 31 years before retiring a couple of years ago. Beneath the brim of a camouflage hat, he spoke with a quiet equanimity. “This whole area was covered by ice at one time,” he said. “This area was covered with swamps at one time; that’s where the coal and the oil came from.” Indeed, this region is part of the Bakken Formation, which boomed and then busted with oil and gas production, though rigs and gas flares are still common, along with elevated land prices. “Things change,” Keith said. I’ve heard this sentiment across Divide County and across our divided country. The confusion is not surprising, given concerted efforts to make climate science cloudy to the public. 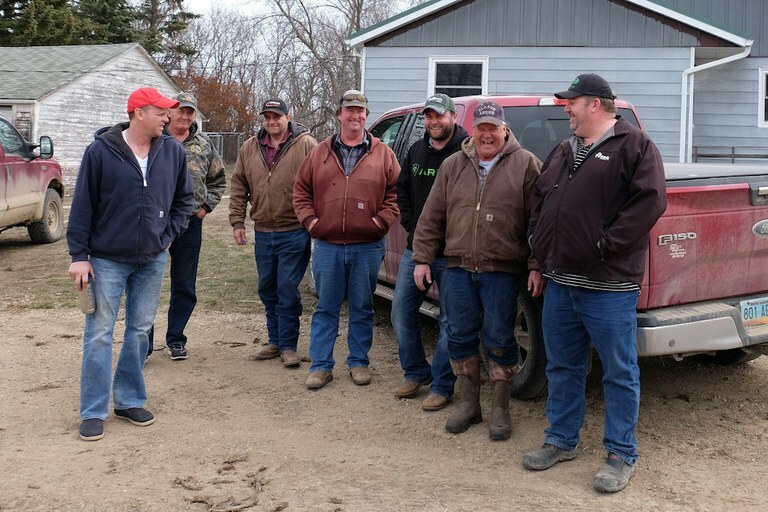 What is perhaps surprising is to hear the “some-say” argument from cooperative extension agents like Keith, who are trained in agricultural science to understand how climate affects farming and ranching productivity and to be the experts within their communities. His statement suggested he was unaware that 97 percent of climate scientists agree that human-caused climate change is happening. The American Association for the Advancement of Science and most other prominent scientific organizations have officially stated their agreement with this consensus. To understand what’s been happening to the atmosphere since the start of the Industrial Revolution, scientists use many of the same data sources that farmers and ranchers turn to first thing each morning to see what the weather is doing. They’re just assessing it with a longer time frame, and adding deeper layers of paleoclimate information for greater understanding. But in this place of extremes, the impact of climate change can be difficult to track. As the North Dakota state climatologist Adnan Akyuz told me, “It’s hard to pinpoint the attribution,” since many factors contribute to extreme weather events. But he recognizes that climate change is having an impact and didn’t hesitate to say that the state is “at the epicenter of these temperature increases.” Like Keith, Adnan referred to North Dakota cycles of wet and dry, harkening back to the ever-present memory of the 1930s Dust Bowl. “I am not ignoring the impact of the increasing temperatures and the changing climate,” he said. “It’s a big factor, because increasing temperature means air becomes drier and thirstier for moisture, and that moisture has to come from the soil.” He also explained how a warming climate exacerbates floods as much as droughts. “You expose yourself to more frequency of floods,” since warm air holds more moisture, so when snow or rain falls, it can come as a bombardment. These familiar extremes getting even more extreme fit climate models that project more frequent and intense droughts coupled with more severe rain storms, according to the National Climate Assessment. Many have adopted no-till farming, which means planting directly in the stubble of the last year’s harvest instead of turning over the soil with a plow. This approach helps leave the soil structure intact, allowing it to hold more moisture — and more carbon. Soil is the unsung hero when it comes to the planet’s carbon storage, serving as a carbon sink greater than the atmosphere and all plant life combined. Only the oceans contain more carbon. Byron Carter (right) and his neighbors talk about how unusually dry Divide County became during the flash drought. “Probably some of the worst droughts I’ve ever had,” said Greg Lee (second from left). “We’re a month away from total liquidation here for a lot of guys,” Jim says. If it doesn’t rain and “green up,” he says, there will simply be nothing for the cattle to eat. The only real luck of last year was that the soil held moisture reserves from prior good years. By April, those soggy savings are spent, and the 18-month reserves of hay that ranchers like to keep at the ready have also been depleted, especially with the hard winter. A couple of days after my visit to Byron’s, I see this fragility in action at the Sitting Bull Cattle Auction down in Williston, the largest nearby city. Most of the year, buyers and sellers arrive weekly from around northwest North Dakota and eastern Montana to buy and sell cattle. As an insurance agent, she handled a lot of paperwork last year as she quietly filed her neighbors’ claims for crop losses. But as part of the auctioneer team, she gets to hoot and holler. “Yah!” Amber bellows when she spots a nearly indecipherable gesture from bidder number 421. During her turn as auctioneer spotter, she constantly scans the afternoon crowd of about 45 men, women and children filling the steep bleachers as two men usher groups of Red Angus cows across the dirt-floored stage. The bidding ramps up in a tongue-twisting tangle of numbers before the cattle are sold to the highest bidder. The spotter hollers when the bidding gets hot. But it’s not as hot this year. More cattle for sale, but more buyers sitting on their hands. Riley Jo Caraballo, 8, is the next generation of Divide County rancher. Her mother, Sydney, wants to leave her a resilient ranch and a better planet. Amber also tells me that she’s not concerned about climate change. Like Byron and his friends and so many other North Dakotans I spoke to, Amber refers to the familiar extremes when talking about the climate. She remembers when the weather was so wet in 2011 she had to truck her cows out a back way to get around flooded fields. And she remembers being a kid in the drought-stricken ’80s, when “you would run and grasshoppers would be flying” because it was so dry. In the face of extremes like this, she told me, you hunker down and manage risks. And “you pray for rain,” she adds. “You have to at least acknowledge and address that there are changes or things going on,” she says. “We had a year last year that was really, really dry. Our hay crop was like a third of what it typically has been. It was devastating to this area.” But, she says, “there’s a deep distrust in terms of what you read” about climate change, and she questions scientists’ motives. “Belief” in climate change falls mostly along party lines in Divide County. During my time there, I met mostly Republicans; the county is clearly a red one, with 71 percent voting for Trump in 2016. But I also met a few Democrats, as well as Independents like Sydney Caraballo, who says she has voted for people on both sides of the aisle. Sydney, in her early 40s, was born and grew up in Divide County. Her great-grandmother homesteaded here back in 1905 after making a land payment of $14. Sydney spent 20 years away, and after marrying her husband Kevin and having three children, they decided to return to her home ground to raise their family. 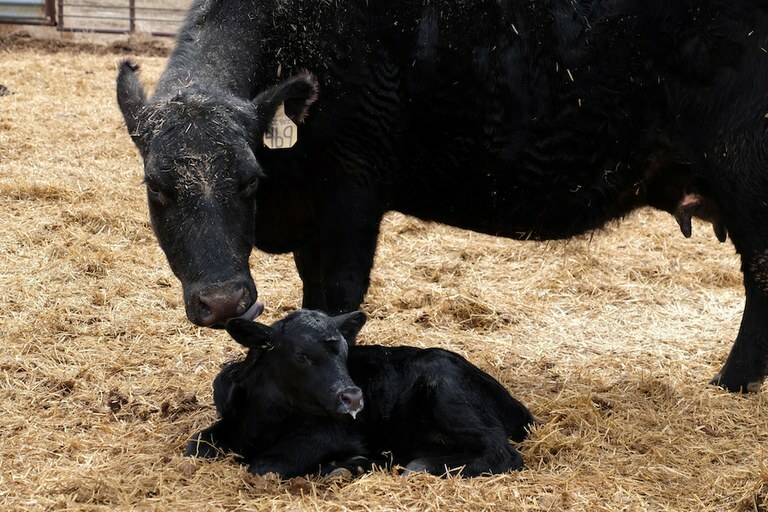 They returned in 2013, taking over Glasoe Angus from her parents and carrying on the tradition of raising registered Black Angus cattle for breeding. They also farm wheat, barley, lentils and more on thousands of acres. They haven’t looked back. The child is standing, in this field, on this land, in her sparkly shoes and floral tights, still as a heron, with her hand outstretched. She is willing three Black Angus calves and their wary mothers to succumb to their curiosity, and they do, sniffing and stepping forward, retreating, returning. She takes steps closer to them, moving slowly, with a hyper focus not often observed in eight-year-olds. And in the gesture, I can’t help but think about North Dakotans and their intimate relationship to the land and the food they help it produce. In that moment, I see Riley Jo and the calves as proxies in our bitterly partisan debate about climate change in this country. Could a fragile connection, fleeting and tenuous, be made unbreakable with time and more trust—in the science that shapes the world we inhabit and the stories we tell each other, whether online or around our kitchen tables? Scientists use many of the same data sources that ranchers turn to every morning to see what the weather is doing, but they’re just assessing it with a much longer time frame and in the context of Earth’s history.